Westport-based singer/songwriter Derek McGowan has just released his first album of original songs, ‘Rainlight’. 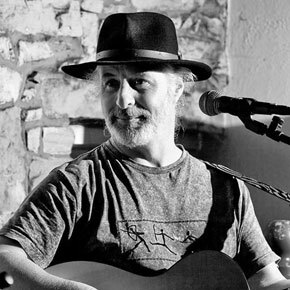 Here, the Dublin-born blues/rock musician, known to many as the lead singer and guitarist of The Piston Slappers, chats to Ciara Moynihan ahead of his upcoming gig in The Linenhall Arts Centre tomorrow night (Wednesday). CM When did you first move to Mayo, and why? DMcG I moved to Mayo in 1984 along with my wife, Eve, and newborn baby, Liza. Although I love Dublin, the changes in the city were phenomenal, a recession was in full swing, and we had been looking for somewhere in Ireland that we felt drawn to. Mayo, and Westport in particular, was it. CM Do you come from a musical family? DMcG Yes, my father sang, my mother played the piano and my brother plays the guitar. My sisters will regale and amuse you with songs and stories. I come from a time when entertaining yourself and family and friends was an important part of your life. Technology was what you plugged your guitar into in the form of an amplifier! My daughter, Kate, plays some piano and guitar, though at the moment it’s purely for her own enjoyment. CM When did you first pick up a guitar? DMcG I was about nine or ten years of age. It was an acoustic guitar belonging to my older brother that I wasn’t suppose to touch. I had an hour every day after school to practise playing, before he came home from football training. I got a guitar of my own then when I was eleven years old, and that’s when I started to play in the morning before school as well as afterwards. CM Who are your greatest musical influences? DMcG Rory Gallagher was a real inspiration, as was Phil Lynott and Brush Shiels. As a young fella I would see Phil and Brian Downey getting the bus to gigs, dressed like rock stars. Freddy White, Sonny Condell, Jimmy McCarthy, Paul Brady, Jimmy Gibson, Jimmy Faulkner, Red Peters would all have influenced me musically, as I loved what they all did. I listened to all the music I could get my hands on in my teens, including seeing bands like Thin Lizzy and Horselips and their mind blowing stagecraft. These were all Irish musicians you could see live and have a chat with before and after gigs. There was no easy access through the internet. We bought our records and tapes and supported the bands at gigs. Going farther afield, I loved Steely Dan, Wishbone Ash, Gary Moore, John Mayall, Bob Dylan, Ry Cooder, John Martyn (who inspired ‘Johnny’s Gone’ [a song on McGowan’s album]), and a multitude of other great musicians. CM When did the The Piston Slappers first form? DMcG Myself, Josie Joyce and Dave Fallon were booked for the Clifden Blues Festival in the early ’90s and had to come up with a name. It took some deliberation and a few pints of porter! Previous to this we were known as White Line, led by Wini Joyce, Josie’s wife, and her fabulous singing voice. Sadly, she passed away in April and we miss her greatly. CM What’s your favourite Piston Slappers memory? DMcG At a Sunday afternoon gig in the Alcock and Brown Hotel during the Clifden Blues Festival, after a blistering Piston Slappers gig, Philomena Lynott complimented the band and said she had never seen such musical energy since Phil and the boys were playing. She was very encouraging and it was a great pleasure to meet her. All the other memories of The Piston Slappers are happy ones too. ‘The Boys’ [another track on the ‘Rainlight’] is a nostalgic musical memory of those times. CM What prompted you to release a solo album? DMcG I don’t feel it’s a solo album. It is all my own original writing but I have the best of Irish musicians bringing my songs to life. I just felt the time had come to record some of the music and songs that I’d written and put them out there for everyone to enjoy. My family were a great encouragement to me throughout. CM What other musicians feature on ‘Rainlight’? DMcG I have great musicians playing with me on the album. David Dee Moore is mellifluous on bass guitar, fretless bass and backing vocals. Anthony McNamee is magnificent on drums and percussion. Joanne Keegan sings like an angel on backing Vocals. Mervyn Sayers is marvellous on tenor saxophone. Patrick Early is melodic on the acoustic fiddle. Kevin Friel plays a mellow acoustic guitar on “Tracks of Time”. Eve McGowan and Sam Mahon sing harmonious backing vocals on “Damn Right” and “Johnny’s Gone”, and Jules the dog barks the outro on ‘House Full of Healers’. Billy Robinson brings all this music together in his masterful mix. Between us all, there must be two hundred years of accumulated musical knowledge gone in to the making of this album. CM All of the songs are self-penned on ‘Rainlight’. What kinds of things inspire your lyrics? DMcG Life, the universe and everything! Really, that kind of sums it up. All my songs have been prompted by events in my life, the people in my life and the people who have left this world. ‘Rainlight’, the title track, is a mystical view of my life in the west of Ireland. ‘This Town’ was written just before we left Dublin, whereas ‘Tracks of Time’ is a metaphorical journey marking points in time in my life and the moments when news can hit you like an arrow through the heart. CM Do you plan to record more solo albums? DMcG I have always been interested in recording and regularly do in my own studio. I have lots of material that I have written and recorded over the years. So yes, I will be releasing more of my music in the near future. CM If someone said you had to choose between singing and guitar playing, which would you choose, and why? DMcG I’d stick to the guitar because I’m a guitar player! Singing compliments my playing and helps me paint a bigger sound picture for my audience, but the guitar is my first instrument. I can talk better on my guitar! Derek McGowan is playing in The Linenhall Arts Centre tonight (Wednesday), June 10 at 8pm. Tickets, €14/€12 (concessions), available from www.thelinenhall.com, 094 902 3733 or on the door. Derek’s new album, ‘Rainlight’, is available on dmcgmusic.com (email littleeden@outlook.ie), as well as at Downtown Records; The Gallery Winebar, Westport; and Christy’s Harvest, Westport.